Right, so the second thing I'm gonna look at (after yesterday's "Lucee 5 beta: static methods & properties") is Lucee's new "Lambda" syntax. This syntax is simply a more terse syntax for defining functions using function expressions. TBH, it's not very interesting. If the function body is a single expression, then neither the braces nor the return statement is necessary, simply the result of the expression is returned. The perceived benefit is, I think, that it's less typing. I think this is a specious gain, as it reduces the clarity of the code, which should be the main consideration. Code is read far more often than it is written. So differentiating this syntax from the arrow-based syntax by using the word "lambda" isn't very helpful. someVar = "In calling code"
A function expression should employ closure, meaning the reference to variables[name] should be bound to the variable of that name in the context where the function expression was first run. This should apply to both function expressions. Only the function-statement version should not use closure. "they allow access to variables in the scope of the containing function (non-local variables). This means anonymous functions need to be implemented using closures." Not that Wikipedia is the anonymous function RFC or anything, but this is the accepted way these things work. There is no precedent I am aware of (not that my awareness is boundless) of differing the closure-behaviour of anonymous functions based solely on syntax style. To me this is simply wrong, in Lucee. A function statement defines a custom function (yes it does), and it's not a closure (no it isn't). Tick. A function expressions is not a custom function (oh... yes it is), and it is a closure (yes, it is). Fail. An arrow function is a custom function (OK, but odd that it disagrees with the function expression result), and it isn't a closure (true, I guess). Conditional pass. That's all a bit of a mess, really. I don't know why they bothered. They need to revise their understanding of industry jargon when it comes to describing this syntax. "Lambda" is not correct (LDEV-251). 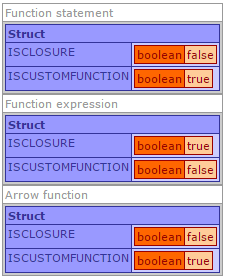 Arrow functions need to use closure (LDEV-250). And the identification functions need to work (LDEV-252). I'm unimpressed with the implementation here. Still: this is a beta, so I'm sure they'll sort it out.